The Event trigger component is responsible for sending an event into Fabric with a specific action (i.e. Play, Stop, Set Volume/Pitch) and parameter values. Every component that is listening for that event within the Fabric hierarchy will respond accordingly. 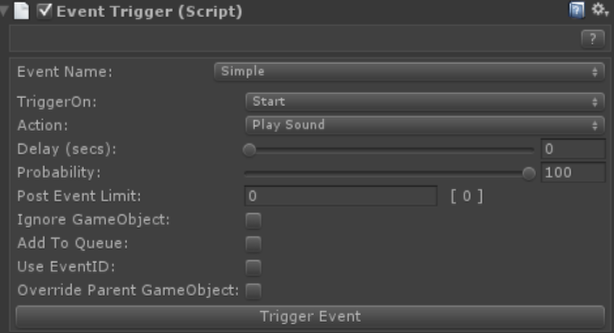 An even trigger can be set to trigger when certain game object function is called or by code through the event manager. NOTE: It is very important to remember that when a game object is used when posting an event it is associated with a component instance. The same game object MUST be used in order to control the instance. Both event trigger and listener components store the event name even if the event manager or event list component are not present in the scene. This will ensure that the event name will not reset to the default, “_UnSet_”, state unless the Clear button is selected. 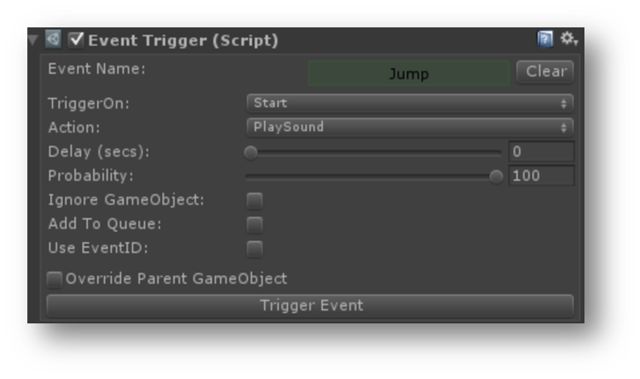 Default: This is the default behavior so anything that enters the trigger area will trigger the event. Defines the percentage of the event trigger happening. Force a trigger of the event. Lowpass resonance Q value. 1.0 to 10.0. Default = 1.0. Highpass resonance Q value. 1.0 to 10.0. Default = 1.0. Echo delay in ms. 10 to 5000. \ Default = 500. Volume of original signal to pass \ to output. 0.0 to 1.0. Default = 1.0. Distortion value. 0.0 to 1.0. \ Default = 0.5. Volume of 2nd chorus tap. This \ tap is 90 degrees out of phase of the first tap. 0.0 to 1.0. Default = 0.5. Volume of 3rd chorus tap. This \ tap is 90 degrees out of phase of the second tap. 0.0 to 1.0. Default = 0.5. The LFOs' modulation rate in Hz. 0.0 to 20.0. Default = 0.8 Hz. Chorus modulation depth. 0.0 to \ 1.0. Default = 0.03. Chorus feedback. Controls how \ much of the wet signal gets fed back into the filter's buffer. 0.0 to 1.0. \ Default = 0.0.